Whether testing out your green thumb in an outdoor cannabis garden or an indoor grow room, there are a few basic supplies every marijuana grower needs. From seeds and clones to the perfect environment, even the most basic cannabis grows require a few must-haves if you’re going to produce those tasty, dank buds you’ve been dreaming about. Though laws vary by location, the general rule is that legal cannabis grows must be in a secured, enclosed space away from minors. 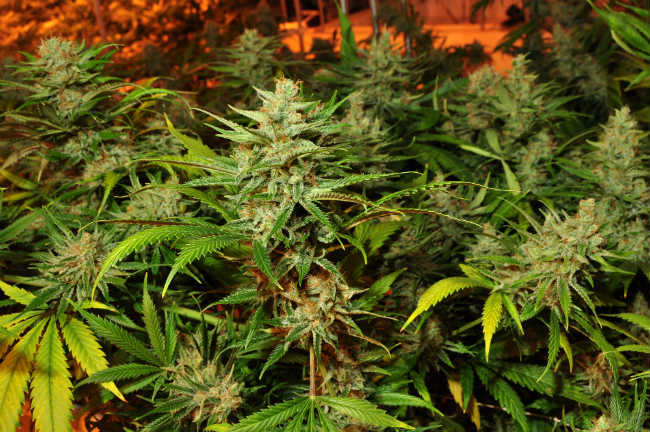 Some of the most popular ways to accomplish this include greenhouses or indoor grow rooms. While some might fare well with DIY greenhouses, others prefer an indoor grow room. Benefits include space, efficiency, containment, security, environmental control and the ability to grow cannabis year-round regardless of the season. The price to set up a grow space varies greatly. The space could include nothing more than pots, lights, and a locked door, or could come complete with multiple grow spaces, lighting schedules, automatic feeders, environmental data, and more. However, flashy products like these can cost as much as $3300, making them less than ideal for the average grower. Instead, many growers use simple grow tents for around $100. These basic tents feature reflective, easy-to-clean lining and an easily secured closure but require the purchase of additional parts like lights and filters. Though there are many grow light options, there are also several things to consider when choosing the best grow light for your set-up including price, intensity (how deeply the light can penetrate the plant), size, and color spectrum. High Intensity Discharge lights (HIDs): Though powerful enough to produce large, dense buds dripping with trichomes, HIDs can get expensive. The fixtures generally start between $100 and $1000 but also require a ballast to protect against electrical surges, a ventilation system to counteract the intense heat, and different bulbs for different stages of growth (and that doesn’t even include the increased electrical bills). Florescent Bulbs: Both Compact Florescent Lights (CFLs) and T5 lighting produce a full spectrum of light for relatively little cost and minimal space. Fixtures and bulbs together cost as little as a few dollars and will increase electrical consumption only slightly. However, florescent lights don’t penetrate very deeply requiring they be kept very close to the plant to be effective. Florescent bulbs are recommended only for seedlings and clones. LED Lights: LED technology has grown tremendously over the last few years because they are cooler than HIDs, have better penetration than fluorescents, and feature a full spectrum of color. The average price of LED grow lights ranges from just under $100 to about $1000, making them an appealing option for a cost-effective home grower. While most beginners prefer soil because of its ability to retain water and nutrients, it is not the only option, nor is it always the best. Here’s what you should know when choosing the best grow medium for your cannabis crop. Soil: Soil is not dirt. Soil is a living environment with micro-organisms, decomposed matter, and all sorts of beneficial critters that work to aerate the soil, provide nutrition to the plants, hold moisture, and act as a buffer against the elements; dirt is basically dead soil. Soil also has a more stable pH than other grow mediums (leaving more room for error) and is therefore recommended for beginners. You can purchase your own soil for less than $10 or make your own using this no-till method. Rockwool: Rockwool is made by spinning melted volcanic rock into a cotton candy-like fluff then shaping it into its final form which is often a small cube. Rockwool has a high pH requiring pre-treatment in a solution with a pH of about 5.5 but once it’s been soaked, both seeds and clones can be grown directly inside. It is highly aerated but requires diligent attention to see that the medium remains moist but not saturated. Rockwool can be reused indefinitely provided it’s thoroughly cleaned after each use. Clay Granules: Clay granules are intended for hydroponic grows and can greatly speed cultivation time thanks to their high aeration. Like rockwool, clay pellets should be thoroughly washed prior to use to balance pH and can be reused after each harvest. Continued use of clay also requires that the water with a pH of 5.5 be regularly replaced to avoid fluctuations and nutrient absorption difficulties. Coco Coir: Coco Coir is another hydroponic medium but this one is made from coconut husks. Coir is beneficial not only for it’s increased aeration but also because of its high Trichoderma content, fungi that help strengthen the plant’s immune system. However, coir must also be pre-treated with a solution of 5.5pH and must be monitored closely to see that it’s pH stays between 5.5 and 6.5. We can’t forget the cannabis itself! To get started on your indoor grow, you’ll need either seeds or clones, both of which have their own benefits and disadvantages. For example, marijuana seeds, though sanitary, add a few weeks to the cultivation process and may not even germinate in the first place. Regular seeds (as opposed to feminized) may also produce male plants that don’t produce flowers but do contribute to seedy weed if they pollinate a female. However, seed banks offer a larger variety than clone stores, and may often ship world-wide. It’s even possible to germinate seeds found in a bag of cannabis! If you’d like to learn more about basic cannabis cultivation, check out our Beginner’s Guide to Growing. Conversely, clones can shave up to a month off of cultivation time, always produce female plants (they’re copies of their mothers, in fact), and are relatively easy to grow. Unfortunately, the selection of cannabis clones will be much smaller because they have to be purchased locally in legal markets. They are also more likely to come contaminated with pests and therefore require a quarantine period before they can be placed in an indoor grow room. With a few simple supplies, anyone of age in a legal state can grow their own cannabis.